SeaLaVie Apartment 91 is located in Umhlanga Rocks on 28 Lagoon drive (sea lodge) with direct beach access via a private gate (80m walk) with stunning sea-views. 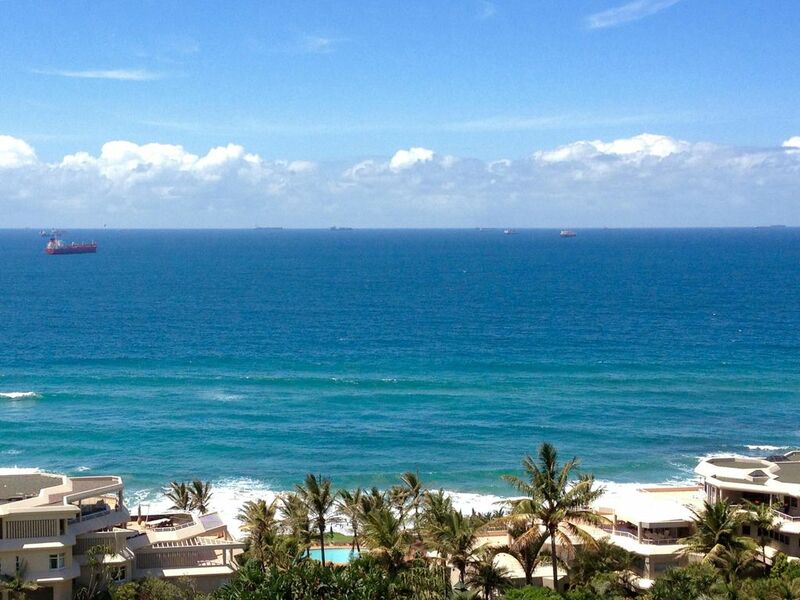 The famous Umhlanga beach and promenade is just a swing away. In the long, luxurious evenings at Sealodge, 91, the lights of the ships glint off the sea like fireflies, while you contemplate the luxuries that await, tomorrow. Here one can experience the luxury and elegance of a contemporary apartment. Outdoor table and chairs are available on the patio for the outdoor escapes to enjoy an alfresco meal. The 112sqm apartment has stunning panoramic sea-views and is equipped with all the modern amenities and new appliances. This apartment is situated next to Edge of the Seas and the renowned Umhlanga Sands Hotel, and walking distance to the beach and village. Spectacular oceans views from this 3 bedroom apartment. Two bedroom, living room and dining area, with sliding doors that open out onto the sea-facing patio. Third bedroom city facing. This apartment has 2 bathrooms. The en-suite bathroom has a shower and the 2nd bathroom has a shower and a bath. •	Lounge and kitchen with granite tops. •	Samsung HI-FI radio (with cd player). •	All necessary crockery and utensils, plus tea/coffee making facilities. •	Property secured by electric fence and automated gate at the entrance. •	Unit is serviced every 2nd day except Sundays and Public Holidays. 2nd bedroom has 2 x singles (sea- facing). These singles can be configured to a king, but with prior notification only. The 3rd bedroom has 2 x single beds. .
House keeping is available on alternative days Free undercover parking available for one car. Excellent property. Loved the view and closeness to eats, fun, and the beach. The property was very clean and just as advertised. The owner met us and explained the property and how things work. The safe didn't, but there may be a method we didn't try. The area is lovely. It seemed very safe and the locals are fitness oriented. So many joggers on the beach Saturday morning we almost got trampled. The beach is incredible and just a short walk from the apartment. Surf fishing is popular and we saw lots of people with surf rods. We absolutely loved staying at SealaVie! Filip the owner was very helpful and welcoming and even left us a bottle of wine, juice and chocolate! Beautiful view of the ocean from every room! Super quick walk to a great swimming beach! Amazing food within walking distance as well! We stayed 8 nights with our two tween boys. I thank you for taking the time to write a review. I am delighted to read that you enjoyed every minute of your stay. I take great pride in my personalized and attentive service. Thank you for choosing SeaLaVie Umhlanga as your preferred destination in South Africa. We hope to welcome you back again ! If you need any help prior to your return, please feel free to contact me personally. We had a 9 day stay in this apartment - my wife and I, our 7 year old son, plus my two elderly parents. The apartment is in a perfect location with a lovely sea view. There is direct access to Umhlanga main beach via a private walkway (2 minutes) and you can stroll to the main restaurant area (Chartwell drive) in 10 minutes. You are a very easy drive from Durban and Durban airport. The apartment itself is great. Open plan kitchen and living area with excellent WiFi and DSTV (equivalent of Sky in UK). The bedrooms are a good size and the master bedroom has an en suite bathroom. The décor is smart and the appliances are all modern. The apartment is cleaned every other day, with fresh linen weekly. There is a nice swimming pool (secure) and a communal braai (BBQ) area too. The owner, Fillip, was very welcoming and had stocked the fridge with essentials prior to our arrival. We had a lovely holiday and I would definitely go there again. Highly recommended. Dear Trevor, I am delighted that you had an enjoyable stay in the apartment and this exceeded your expectations.That is exactly our aim. It wouldn’t be possible however without all the lovely guests we have the pleasure of welcoming here. Thank you for choosing the SeaLaVie Umhlanga as your preferred destination in South Africa. The property is situated on the beach and has direct access to the swimming beach though a private gate.The airport is just 15 Km away. No need for a car as all amenities are waling distance away and close by. House Rules are binding on Guests and Visitors and any issues must be promptly reported to the Manager. Noise and Residential Amenity Offensive noise and anti-social behavior is prohibited. Visitors Only guests that are booked for, are allowed to occupy the apartment Gatherings or functions Parties and non-compliant functions or gatherings are prohibited. Parking one undercover parking bay for one vehicle is permitted and open bay parking is available Garbage Garbage can is disposed at the disposal area on the lower ground level entrance back exit. Swimming pool Entrance to the pool is via the ground floor. Only guests that occupy the holiday flats are only allowed to use the main pool at the apartments Smoking The apartment is strictly NON-SMOKING. Failure to adhere to this, will forfeit breakage deposit. Pets No pets are allowed in the apartment. Damages and breakages Damages and breakages must be reported to the Manager. Stained linen and upholstery will be charged for. On departure arrangements on departure the apartment must be left in the same condition as on arrival. Emergency Contact Emergency contact name and telephone numbers are provided. Compliance Consequences of non-compliance are specified including termination and eviction.